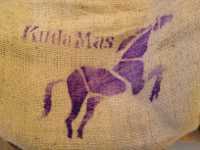 This is a top notch Mandheling from the Golden Horse or Kuda Mas Estate. Great physical presentation coupled with the hearty characteristics of a typical Sumatran make for a quality coffee. The wet parchment beans are sundried before being hulled. After hulling, the coffee is further sundried to a moisture level of about 13%. Screening the coffee with gravity tables further cleanses the coffee. It is after this screening that the coffee is then handpicked for a third time or (triple picked) and the coffee is then ready to be bagged.